You may have been the kid who shoved ten cookies in their mouth when your mom turned her head. Or, you may have been the tattle-tale little sister who ate one cookie off the Christmas buffet, just so she could pompously compare the two eating habits in front of your parents. Either way, there is a better answer that lies somewhere in the middle for our own children. Watching kids devour food they really enjoy always leaves one wondering where they put it all. Little tummies can only hold so much, and it takes careful planning to make sure that at least some of that space is for things on the bottom of the food pyramid. During Christmastime, many families enjoy a full schedule of dinner parties, work socials, and family gatherings. And what is at every one of these events? That’s right, an unlimited supply of cookies, cakes, candy, and any other sweet not aforementioned. Decorated with all the alluring colors of the season, the desserts are sure to attract little-grabbing fingers. This puts our parental brains in a conundrum. Do we follow our children around like little holiday helicopters in heels, or do we pack a plastic bag in our purse for the possible tummy woes later in the night? After all, this is your time too. A little adult conversation while wearing lipstick is hard to come by. Many experts will tell you to limit treats this season, by keeping a good sized chasm between your children and the dessert table. These experts must not have kids, because we all know that by restricting something, it makes them want it all the more. “It takes a mindshift to go from nutrition to habits and from feeding to teaching”, says Rose. Kids could generally care less about nutrition, and just want to eat what tastes good to them, what gives them immediate gratification. Now don’t get me wrong, there is the child who is at the park telling the other kids they should throw their Cheetos away because they are not healthy, but that kid is not the norm. 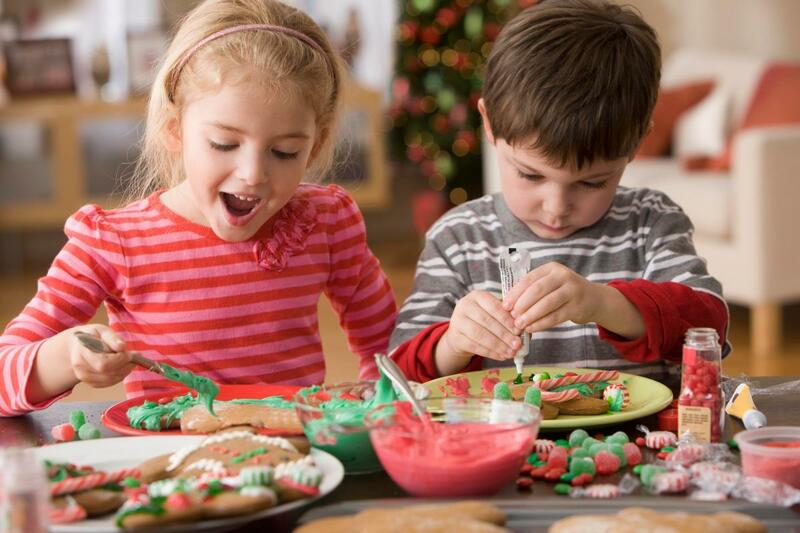 Talking to your children about creating healthy habits of proportion, variety, and moderation is how Rose suggests you make it through Christmas parties without worrying about your child going on a sugar binge under the table. Before going to an event that will offer a table of treats, show your children what a proper amount of desserts are, such as suggesting they pick two favorite desserts and have one of each; one chocolate chip cookie and one gingerbread snap for example. Let them know that taking all the chocolate chip cookies isn’t saving any for the other guests and that they should try something new. Moderation is key, don’t we know. A few treats once in a while isn’t going to sabotage someone’s healthy lifestyle, but having a pint of Ben and Jerry’s every night after the kids go to bed can really add up in all the wrong areas. She makes a good point that watching every bite that goes into your child’s mouth sends them the message that you can’t trust them, and that is not the relationship we are trying to establish with our children. Contrary to popular belief, kids know how to self-regulate well, as long as they don’t feel they aren’t going to be given the opportunity to indulge again. Every event has the mom that holds dessert hostage until a particular number of bites of the entrée has been taken. On the other hand, Kuzemchak believes that if you let you your child put their dinner and dessert on the same plate, they will happily eat of them both without complaining; giving mom and child a less stressful evening. Check in with your child throughout the night to ask how they are feeling, and if they want to save any of the desserts to have after lunch the following day. The key is to keep a healthy diet at home that incorporates proportion, variety, and moderation on a daily basis. If the kids are used to eating a certain way without being monitored and regulated at home, chances are they won’t put much more thought into doing something different at a party. Kids will be kids, and they may have slip-ups, eating one too many peppermint truffles, but then again don’t we all. Please let us know in the comments section if you have a way you handle children and the dessert buffet that works.